Echa un vistazo a la mejor ginebra de Londres en un recorrido por la ciudad en un clásico Mini Cooper. Con un toque divertido en una experiencia turística, el tour visita los lugares de interés de Dickensian London, así como algunos de los tesoros escondidos de la capital, y bares de ginebra, por supuesto. 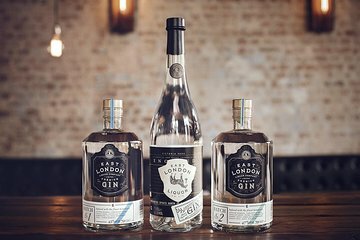 Degustarás ginebra en dos de los amados bares de ginebra de Londres y visitarás una destilería para ver cómo se prepara la icónica bebida británica. Relájese mientras un conductor guía recorre las concurridas calles de la capital. Ver el proceso de producción de la ginebra en acción en una visita a una destilería. We loved this tour! It was everything we had hoped for and more. Our guide, Sam, was very friendly and knowledgeable about all things London and gave us a wonderful background on the history of gin and also current trends in the distillery industry. We visited some great bars with vast selections of gin and with some very special “Spirit Guides” who provided quite the immersive experience. Who knew there were so many varied taste experiences in the world of gin and tonics! And of course you cannot beat riding around London in a Mini Cooper. Although I thought we might need “the jaws of life” to extricate us from the car until we got the hang of exiting the Mini. All and all, I would highly recommend this experience!